Hey folks... we've got some interesting stuff coming this week from John Pudner again. However, before we get to that, I just wanted to recap the numbers associated with the West Virginia game. What should immediately stand out is the defensive efficiency. Marquette's offensive efficiency was about average, but the defense was great. Two of the last three games (this one and Cincinnati) have ended up with stellar defensive efficiencies. Considering our defensive ranking of #49 lags behind our offensive ranking (#8), it's nice to see those results. Marquette ended up winning on all four factors. Although OR% was essentially a wash, winning and holding WVU below their average helped the overall win margin. TO Rate was a huge key for Marquette, considering that WVU typically forces opponents into a turnover rate of 27%. The Free Throw Rate was a huge disparity, but more because WVU's rate was so low. As for the recommendations that were posted on the preview, the results and impact can be found here on MUScoop.com. No need to recap twice. Okay. Flat out. I. Was. Wrong. 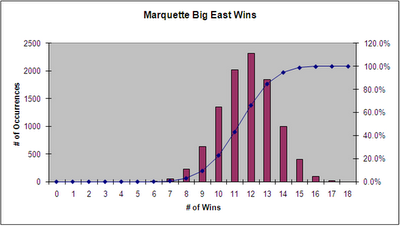 Since my initial doom and gloom about what to expect this year, Marquette has surged out of the gate. The offense has been playing well, and the defense has been very strong in two of the four contests. Not only is 9-9 no longer the most likely scenario, but given the way the team is playing now, there is a 90% likelihood of finishing with 10 wins or more. Now, I still see 12-6 as the most likely scenario (instead of Pomeroy's 13-5 prediction). However, there is a 57% chance of getting 12 wins or more, a 33% chance of getting to 13 wins, and even a 15% chance of finishing with 14 wins. Things would have to go very well, especially on the road (PC, DPU, USF) and down the stretch. If you don't want to get too greedy with the current predictions, there's still about a 45% chance of finishing with 11 wins or less. Regardless, I'd sign up for 11-7. Saturday's game will be a tough one. Life is hard on the road, but should Marquette win, it'd be reasonable to expect very good things this season. I'll agree with you on 11-7. They look good, but the only game I thought might be a loss before conference play started was West Virginia. We have yet to see them react to a lull in the season, but I will say that they are playing better than I anticipated and have been fun to watch.